I had some time consuming technical difficulties occur while recording guitars and bass for the new full length album. I'm currently working on remedying the situation so I can get back to recording as soon as possible. Originally my plan was to release the new album around February 2014 but at this point I think a May or June release date would be more realistic. 2014 Album Update 2: Drum Tracking is Finished! I've finished tracking all of the drums for the upcoming full length album. Next up: Recording Guitars and Bass! Born of the Stars won a contest! The OurStage community ranked the song 'Awaiting' by Born of the Stars number one in the Modern Rock channel for the month of September! Special thanks goes to OurStage and everyone who voted for Born of the Stars! I hope you are all doing well. It’s been awhile since I've posted any updates and I know many of you have been emailing me wondering what the progress is on the upcoming full length album. I've been hard at work and I finally have some good news to share with you! I have finished writing all of the music and lyrics for the new album and I have already started the recording process! I am currently working on finalizing the drum tracks and soon I will be recording the guitars and bass. Be sure to stay tuned as I will be providing more frequent updates on the status of the new album to the Born of the Stars website, blog, facebook, and twitter. A new album is in the works! The writing process for the upcoming full length album is currently underway and so far everything is going great! I have a bunch of awesome new songs in the works and I can't wait to let you hear it! My plan is to release this album around January/February 2014. To stay up to date on the album's progress you can follow Born of the Stars on Twitter @botsmusic, like Born of the Stars on Facebook, or subscribe to our email list. Download the song 'A Change In You' for free! Download the song 'A Change In You' for FREE from the Born of the Stars Bandcamp store! Tomorrow (Saturday 02/02/13 at 8pm GMT) the song 'A Change In You' from the debut Born of the Stars EP will be featured on the Amazing Rock Show on Amazing Radio! The show will also be repeated the following Tuesday (02/05/13) at 10pm GMT. Special thanks goes to @AaronPhillipsdj for the support! The debut Born of the Stars EP received a very positive review from the Infernal Masquerade Webzine this week receiving a rating of 85/100! "The best song of this release comes under the name of “A Change In You”, a true rollercoaster experience that is full of cool drum patters, solid riffs and very effective vocal lines. For a 5 song release, this EP is quite the presentation card for Born of the Stars. 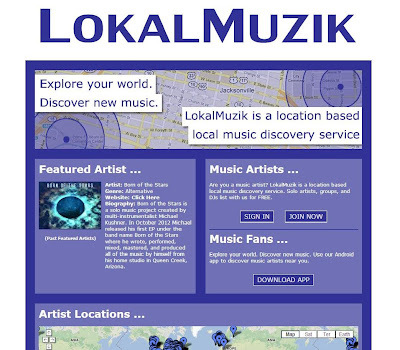 We are pleasantly surprised with the quality of the music and production found in this EP and hopefully will get the band noticed by labels"
Born of the Stars has been selected to be the featured artist of the week on the location based local music discovery service Lokal Muzik! The song lyrics for One Day, Awaiting, and A Change In You have been added to the official Born of the Stars bandcamp store. Here are the direct links to the lyrics for each song. Enjoy! "When you listen to a solo project of this kind, you would always expect to find any weak spots in any of the instrumental or production phases; however, when I listened to it, it turned out to be a flawless piece of music." More great news in the new year as Born of the Stars came in at #10 on 13SRadio: Thirteen Steps latest #MetalTop40! First I'd like to thank all of the fans, blogs, podcasts, and radio shows that showed their support for Born of the Stars in 2012 - you guys are awesome and I'm very grateful for all of the kind comments, reviews, promotion, and everything else you have done to help this project move forward! Thank you all! There is a lot in the works for Born of the Stars in 2013 as I am beginning work on the next release (a full album this time) which should be out sometime later this year. I will also be working on putting together a live band/concert experience for later this year. If you want to stay up to date with all that's going on with Born of the Stars then sign up for our free newsletter, subscribe to our blog, follow @botsmusic on twitter, and/or like Born of the Stars on facebook! Born of the Stars is a solo music project created by Michael Kushner. In October 2012 Michael released his first EP under the band name Born of the Stars where he wrote, performed, mixed, mastered, and produced all of the music by himself from his home studio in Arizona. The debut self-titled EP is a concept EP featuring 5 tracks that combine elements from many different genres of music including alternative rock, hard rock, progressive metal, electronica, and post rock. Featuring heavy guitar driven soundscapes juxtaposed with clean vocals, positive empowering lyrics, and beautiful melodies and atmospheres Born of the Stars takes you on a captivating aural journey. Michael is currently working on a full length follow up album set to be released in 2014.